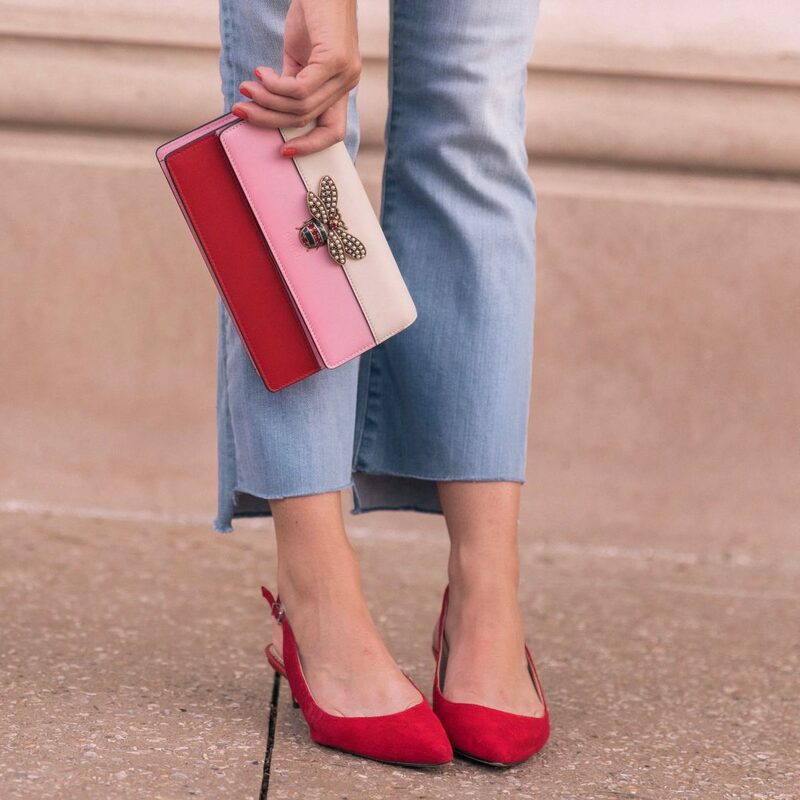 BLOUSE, JEANS, SLINGBACKS, CLUTCH, EARRINGS: click pink links for more! 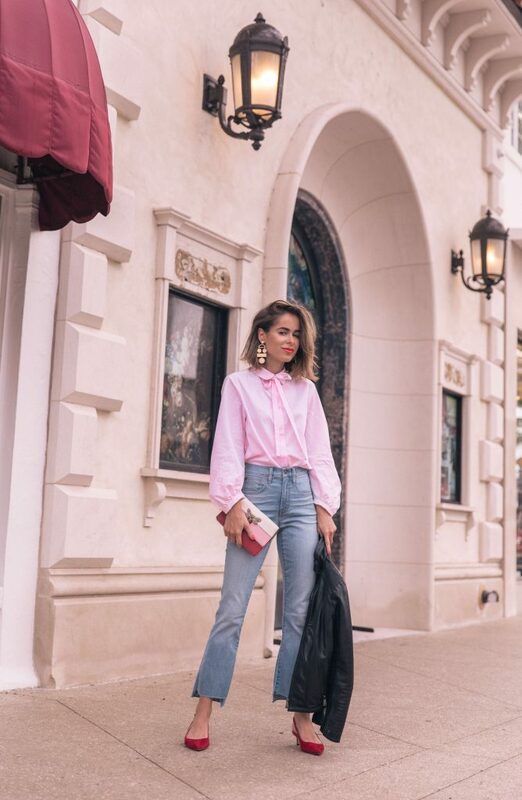 As a blogger, I work really hard at cultivating relationships with brands that not only make sense for me and my style but that I also adore. Yes, this means I grow slower and turn down a lot of projects but at least I stay true to myself and never compromise! Anytime I travel outside of Florida, I bring a black leather jacket with me especially when visiting a major city like NYC, Boston or LA. Why? Because it goes with everything which means more room in my suitcase to go shopping for shoes. You guys know this; you’re savvy! But just in case you don’t, a black leather jacket can be worn with a white t-shirt and jeans, skirt and tights, a silk gown… just about anything you pack. AKA the EASIEST item to style when you’re on the go! 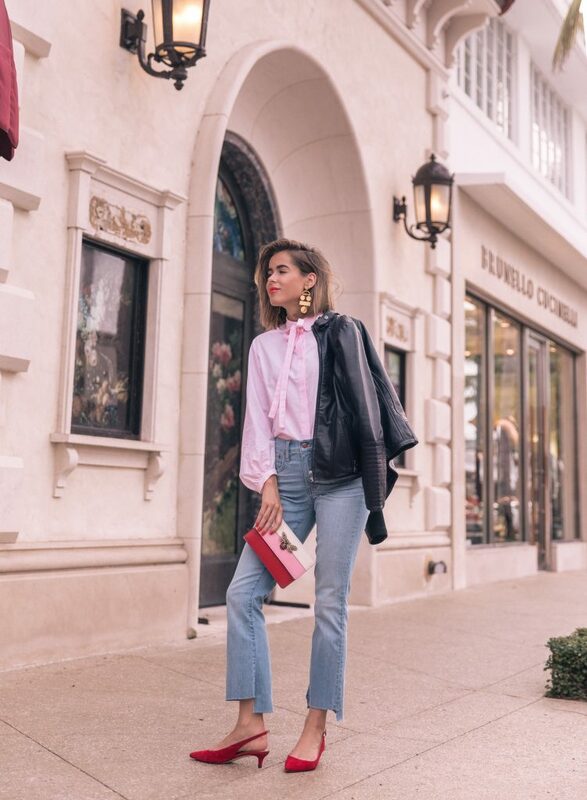 Trust me when I say this, a black leather jacket is a wardrobe staple, and this version has all the markers of a classic – from the zippers to the belted collar. It’s made from supple leather that will only get better with age (like wine and cute guys) and is finished with cool snap buttons too. Today I paired mine (did I mention it’s on sale from $410 to $270? Yeah, run. Don’t walk.) with a feminine cotton blouse, cropped jeans and slingback heels. For more from Bernardo, click here! Currently running faster than I’m typing!!! Too cute!! I lovvvvvvvvvvve wearing leather jackets. Especially like this one!! Major heart eyes, is an under statement! !